I love to throw theme parties! I have mentioned this in the past and I have even shown you how to throw an Oscar party showing your Disney side! I like to throw elaborate parties like the Oscar party but I also like to do lower key events as well. Hosting a movie night or movie afternoon on the weekend is a fun way for me to get my creative juices flowing and still not go too overboard (I admit, that happens from time to time). 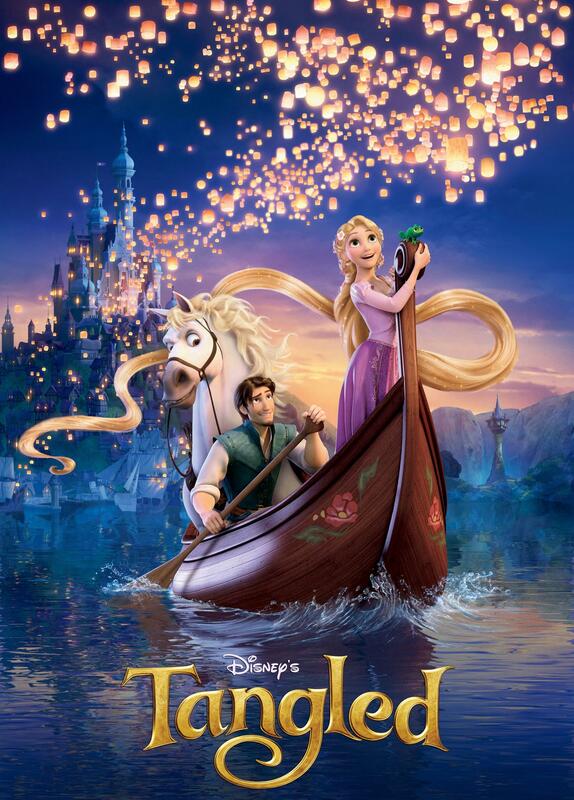 Today I am going to give you 5 ways to host a movie night with the feature film being Tangled! 1. 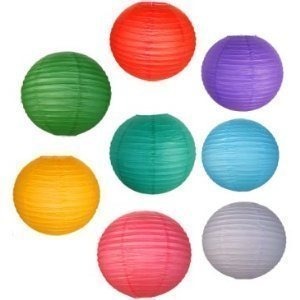 Chinese/Paper Lanterns– I do not assume that you can have the real lanterns, like you see in the movie, so we are going to use the next best thing to decorate. Now, for me, this is not a huge expense because I can also use these on my patio or in my screened in porch! I love to use multicolored lanterns but you can use whichever you like. Just have a few and have them dangling from assorted heights from the ceiling, or fan or window… whatever is convenient for you. It really sets the tone. Here is where I got mine and they were less than $20 including the lights! 2. Have Themed Drinks– This is easier to do than having a whole buffet of difficult to make treats. It’s just a movie, not a party, though this idea could easily transcend into a children’s birthday party! I was thinking of something along the lines of blue Kool-Aid with a orange slice in it… this represents the water and the boat for when Rapunzel and Flynn go to see the lanterns! If you want to take it the extra step, you could even make purple sun flags out of paper and use a toothpick to attach them to the boat! I actually saw this idea on multiple boards on pinterest! 3. Sun Shaped Sandwiches– The symbol of the sun is another important theme through out the movie, along with the lanterns. 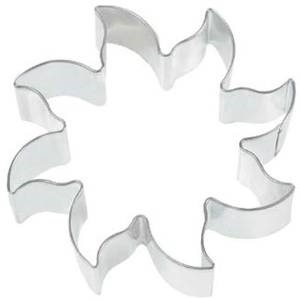 I found a sun shaped cookie cutter and I have used it to make cookies BUT, if I don’t feel like decorating cookies, I make sandwiches! I actually like to make grilled cheese sandwiches with them! Who doesn’t love a good grilled cheese sandwich? 4. 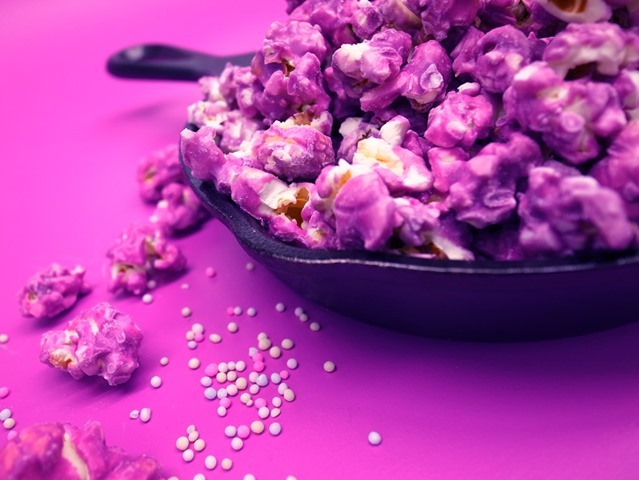 Purple Popcorn– You know you find this one intriguing. I will admit I found this idea on Disney Blogs a long time ago but it’s such a great idea, I am constantly using it. Purple is one of my favorite colors, along with pink, so any change to make purple or pink popcorn and I am in! Disney Blogs states that you need popcorn, purple candy melts, a large bowl, a wooden spoon and a cookie sheet. Here are the instructions they say to use and I promise they work perfectly! Make 2 packages of microwavable popcorn in the microwave. Once popped, empty contents of the popcorn bags into a large mixing bowl. Place purple candy melts into a microwavable bowl and microwave for 45 seconds to 1 minute or until fully melted. Caution the candy melt will be very hot. Pour the melted candy melt over the popcorn and mix thoroughly with a wooden spoon. While the popcorn and candy melt mixture is still warm, sprinkle with sprinkles. Spread the party popcorn mixture on a cookie sheet and let cool. Serve in a cast iron skillet or frying pan for a great Tangled movie night snack. 5. Decorate With Fresh Flowers– Clearly flowers are another theme in Tangled so having fresh flowers in the room will enhance the overall effect. If this is a party for teenagers or little girls, braiding each other’s hair and putting some fresh flowers in the braids is also an option to take this idea one step further. I was catering the idea to my adult friends who are Disney lovers and enjoy a guilt free Disney night amongst adults. (Of course, the Kool-Aid may also be converted to an adult beverage when I have my friends over as well). That’s my idea of throwing a simple, not too over the top Tangled themed movie night. Most of the items I use I can reuse or have to keep my home looking lovely (the flowers) so I don’t consider it too much of a financial burden for me. My friends love my theme nights and they will love yours, too!! What do you think? Will you use any of these ideas for a movie night with friends? Maybe for a birthday party? Let us know in the comment box below! Thanks to Disney Style Blog for the picture and popcorn idea!